Are you tired of the way regular light-bulbs cramp your style, and don’t allow you ways to express your unique, special personality? Well get rid of those boring old tungstens, and have a look at this! The App Controlled Smart Light bulb is a funky new take on the traditional light source found in every home. Lasting over 30 times longer than a traditional bulb, while costing less than a fifth of the electricity, Lumen is the revolution that is taking the world by storm, and making light-bulb manufacturers angrier than an angry light-bulb manufacturer! “But what is so unusual about this bulb?” I hear you ask. So, so many things, is my answer. This is the light bulb of the future, adaptable to every situation and mood, and allowing you to alter the lighting of your room at the push of a button. From Sunday morning sleep-ins, to wild parties, this has you covered. And to do this, the App Controlled Smart Light bulb harnesses the power of the internet! That’s right, what is truly unique about this inventions is the App-controlled settings. Everything about it is controlled right from your smart phone or tablet, making it more convenient and useful than any light-bulb you have ever seen before ever! 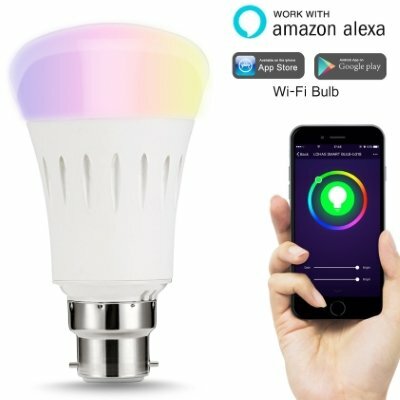 You can opt to use the built-in presets, that are already programmed into the App, making it easy to change your bulb’s colour as soon as you plug it in. Start your day with the soft glow of a sunrise, with the Sunrise mode. Or, if you have places to go, and people to see, use the Wakeup mode to shock you into alertness at the time of your alarm. Then you can use the Relaxation setting to help you wind down after work, or the Romance button if you need that special someone to feel in the mood! There are three more modes as well; Proximity, Party, and Call Alert, and all of these can be instantly deployed from your iPhone or Android phone! The app works from 10M away from the bulb, and can control up to 10 bulbs simultaneously. With 400 lumens of light power, and over 16 million colours, you can make your own settings quickly and easily, bathing your bedroom in that exquisite shade of lilac light you have dreamed of for years, but never thought would be yours! Get the party started in your house today, and finally overthrow the tyranny of the boring white light-bulb, with the Lumen; taking the light-bulb to a whole ‘nother level!